Hosepipe ban in the UK is bad news for gardeners but good for business at Artificial Grass 4U. Orders up 200% as people plan to replace their lawns in time for the summer. Several factors have combined to produce a marked increase in orders at Artificial Grass 4U. Record March temperatures in many areas of the UK and the prospect of a long hot summer are the first of these. The UK has been basking in unseasonably warm weather for the past 2 weeks and forecasters are predicting that this will continue through the summer months. Secondly the introduction of hosepipe bans in many areas of the country spells bad news for gardeners. The prospect of a blistering summer and no water for lawns and gardens has been good for business at Artificial Grass 4U. Director Paul Lynch has said “This is without doubt the busiest we have been” and he added “The hosepipe ban has had a positive effect on our business as people rush to replace their lawns”. 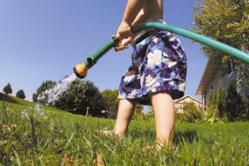 A number of major water suppliers are bringing hosepipe bans into place from April 5th 2012. The ban is a result of low rainfall levels over the autumn and winter with many regions experiencing just ½ of the average rainfall they would normally expect. Seven of the UK’s water companies have so far announced plans to introduce bans on hosepipes. These include Anglian Water, South East Water, Southern Water, Sutton and East Surrey Water, Thames Water, Veolia Water Central and Veolia Water Southeast. Anyone who is found to be breaking the ban could be subject to a maximum fine of £1,000. While the ban on hosepipes is not good news for gardeners it is great news for Artificial Grass 4U. They have seen a record rise in inquiries and orders as people look to replace their lawns and grassed areas in time for the summer. Artificial grass obviously requires no water to keep it looking good and stays lush and green all year round.